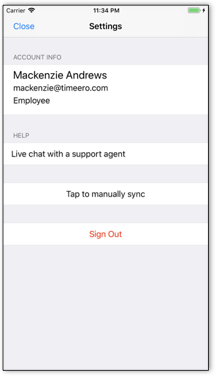 Timeero mobile app periodically syncs changes in a smart and efficient way. The iOS and Android apps are built to work offline so you can continue tracking time even when you do not have wifi or a data connection. Once you are within a reasonable connection range, you can re-open your app and your data will be synced up. Some changes made on your device or outside your device may not manifest immediately. For example, if a job is added by your administrator, it may not show up immediately. However if you want it to show up immediately, you can trigger a sync by going to Settings and tapping on the sync button. 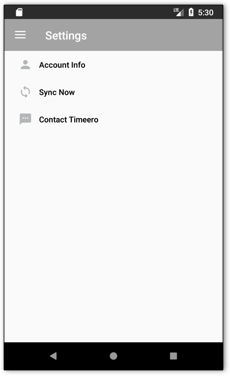 This will manually force a sync on your device hence all your changes on the device will be pushed to the cloud (if they haven’t already), and the latest changes from the cloud will get saved on your phone.